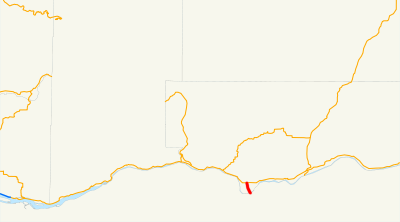 On Tuesday, May 29, 2012, we drove the entirety of US Route 197 within Washington, also known as Washington State Route 197. Impressive, no? 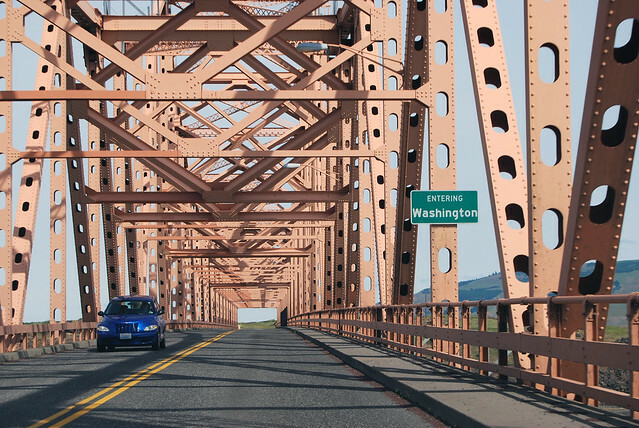 Beginning at the Washington-Oregon boundary on the interstate bridge across the Columbia river in the vicinity of The Dalles, thence northerly to a junction with state route number 14. A stone's throw downstream of The Dalles Dam on the Columbia River, we cross from Oregon to Washington upon this lovely orangish-pink bridge. "The Dalles," by the way, is a name that refers to the large, flat rocks in the river that we're passing above. Suddenly we're in a rather barren landscape. 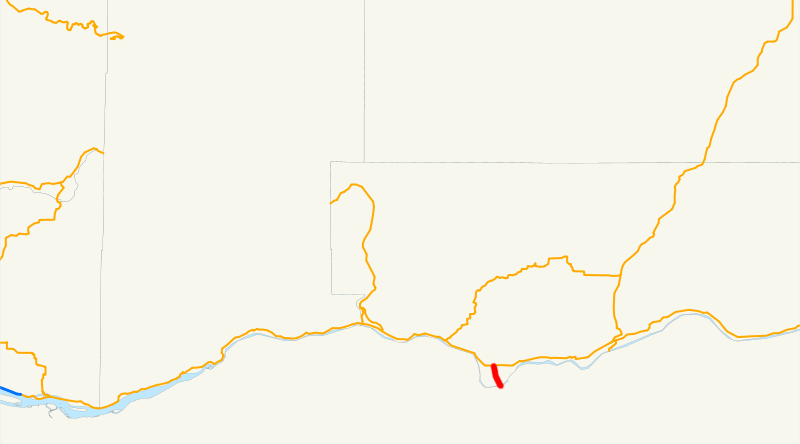 US 197 traverses the flat area inside the bend of the river, so I'd expect it to be filled with farmland. It seems that the soil is too rocky, because less than a quarter of this area is farmed. A mile and a half after the state line, we reach the halfway point of US 197 in Washington. The town of Dallesport is to the left and behind us, down the hill by the farmable land. 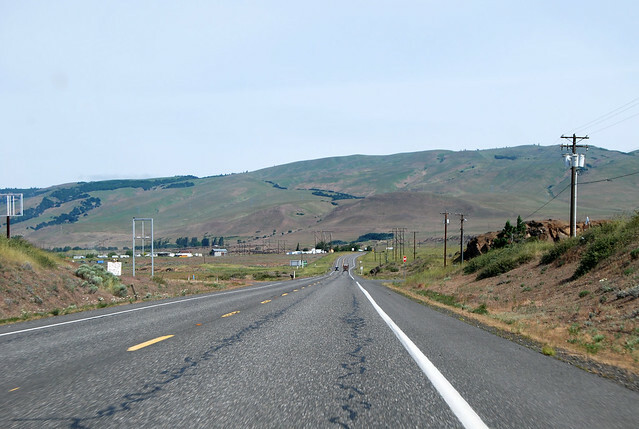 Another 1.5 miles across the southern nub of Klickitat County later, we reach a junction with SR 14. 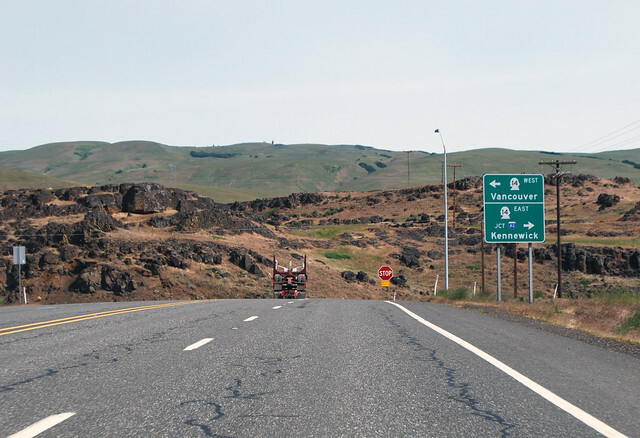 US 197 is at an end... although it originally turned east here and reconnected with US 97 in Goldendale (and later in Maryhill). In the 1970s, Olympia decided it was confusing to have a north-south highway running east-west, so they dropped that portion. It wasn't until 2006, however, that they remembered to tell AASHTO, the national organization that keeps track of the US routes. Whoops! 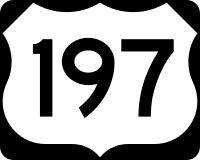 Thus US 197 is a rare breed of US route that doesn't end at another US route or Interstate. Around here, though, SR 14 might as well still be US 830, for it still serves that function. Oh, I seem to have gotten on a tangent. My drive on Washington State Route 197? Quick and sunny, with a nice view of the Columbia and The Dalles Dam. Four years you have been working towards this goal, and you are about halfway there! But it might go more quickly now, since the highways are shorter (than SR 2, 5, 12, 99, and 101) and clumped together along the feeder route. Happy drives! I expect to finish near the end of June 2016. So yup, just over halfway done!